Father Thabet walks amongst the rubble in Karamles, his hometown. Now the smoke has gone from the Nineveh Plain, it is clear that Islamic State fighters dealt one final, vicious blow to the Christian population before surrendering its occupied towns: by systematically setting fire to their homes, thousands have become practically uninhabitable. Suddenly, for many Christians, the prospect of returning home seems further away than ever before. “This is it. Everything else is gone,” says one man, as, with a loud bang, he slams shut the door of his car. The only things he has managed to salvage from his house are a pile of books, a pair of shoes and some family photos. We are in Ashti Camp in Erbil, Iraqi Kurdistan. This man has just returned from his home in Bartella, one of the recently liberated Christian towns on the Nineveh Plain. In the summer of 2014, IS fighters forced this Iraqi Christian and his family to flee, leaving all their belongings behind. Over the past two years, other families left Iraq, but his family stayed, dreaming of one day returning to their beloved town. But now the dream has been shattered. When, in October, several Christian towns on the Nineveh Plain were liberated, there was an initial outburst of relief and celebration among the displaced Christians in Erbil. Suddenly their dreams of returning home, of having a future in their cherished motherland, seemed within reach. But over the last few weeks, priests, militia and Christian volunteers have been mapping the degree of devastation in the Christian towns. The results have been increasingly disappointing. 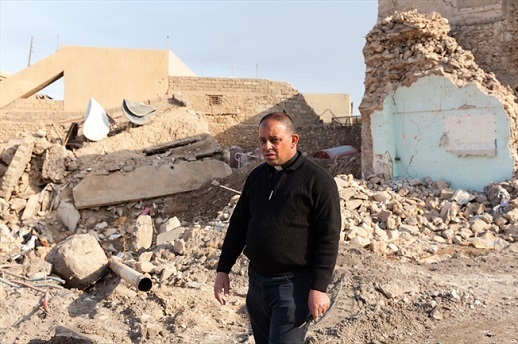 In large Christian settlements like Bartella, Qaraqosh and Karamles, about 80 per cent of the houses have been either completely destroyed by Allied bombs and mortars, or burned out by ISIS. The result: in their current state, they are uninhabitable. Fr. 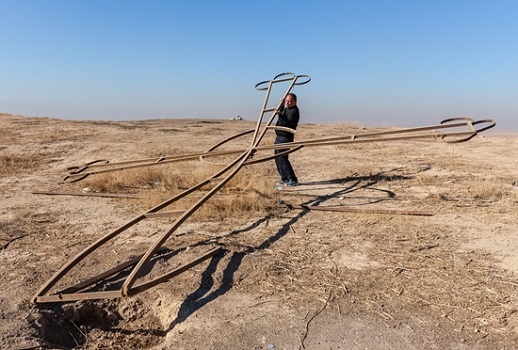 Thabet on a hill outside Karamles, picking up a cross toppled by Islamic State. One of the volunteers, who has been assessing the damage in Qaraqosh, speaks of a well-coordinated path of destruction left behind by IS. Everywhere the team goes in Qaraqosh, all the valuables have been looted. Furniture has been thrown out of the windows and family photos are scattered everywhere. On top of that, some homes’ foundations have been severely damaged by the tunnels dug by IS fighters. Father Thabet, a priest from Karamles, says it is clear IS set fire to the Christians’ houses only days, or in some cases hours, before its militia were ousted from the town. Initially, people assumed that the smoke was coming from piles of tyres, burned to block any view from the air, but in fact it was homes on fire. For the priest himself, the loss of sentimental items like family photos of dead relatives is particularly hard. Visiting Karamles with Fr. Thabet, the destruction is overwhelming. Almost all the windows in the town have been broken and most homes severely damaged by fire. A decapitated statue of the Virgin Mary stands in front of the altar of this badly damaged church. Fr. Thabet points towards a huge pile of rubble. The priest says he is still eager to rebuild his town, and with a team of volunteers he has already begun clearing out the mud IS left knee-high in his church. But he admits that returning will be hard. “There is no electricity, no water, nothing. Do you know how difficult it is to start cleaning without water available? This process is going to take longer than some people have expected,” he says. 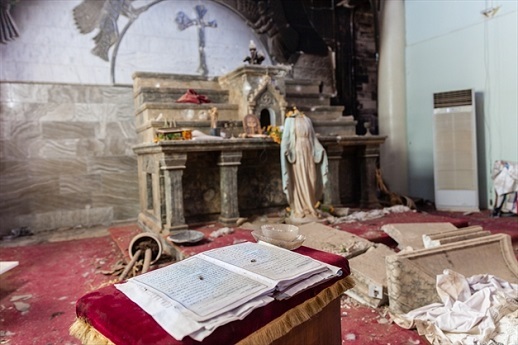 Although the degree of destruction in the liberated Iraqi Christian towns is devastating, the first signs of Christians preparing to return are visible. 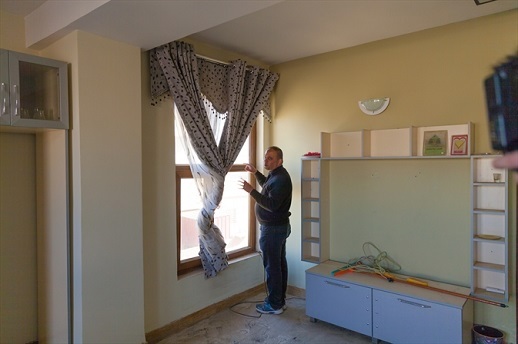 The first Centre for Support and Encouragement is about to open its doors in one of the liberated towns, supported by Christian charity Open Doors. The local Church expects centres like these to play a crucial role in facilitating and energising the first wave of returnees. That is why it is currently preparing the vicarage to start functioning as the centre. Fr. Thabet points at a house next to the church. Just the day before, the broken windows were replaced and the door was repaired. Fr. Thabet inside what will become the first Centre for Support and Encouragement in the Nineveh Plain. He opens the front door and shows how the house is not burned and can be made into a basic centre for the first returnees relatively easily. “We will offer services to people who are working in this town. Here they can find rest, food and sleep,” he says. The local Church plans to open centres like these all over the Nineveh Plain, as first outposts for returning Christians. He doesn’t expect this to happen in the coming months. With IS still a stone’s throw away and the battle for Mosul still raging, not a single Iraqi Christian seriously thinks of moving back already. And even if IS was ousted completely, many Christians would need hard guarantees of political and military protection before they would feel safe enough to live in their towns again. “The whole international community has to come up with a solution for the Christians here,” Thabet says.